How is the furniture checking if there is a fire in any direction? Are you using a collision sensor for that? Thanks again so much. Obviously i check each tile wich is adjacent. You get the picture. Its killing performance on flash though. PC/Mac download is okay. I use a similar system for the digging and i am also working on a freeze over mechanic. Gotcha. Thanks for the screen shot of the code. Makes much more sense now! I'm working on a game (in it's infancy) and already I'm thinking about having the PC/Mac as the target. The things I want to do will be too intensive for Flash I believe. I'll stop asking questions for now! 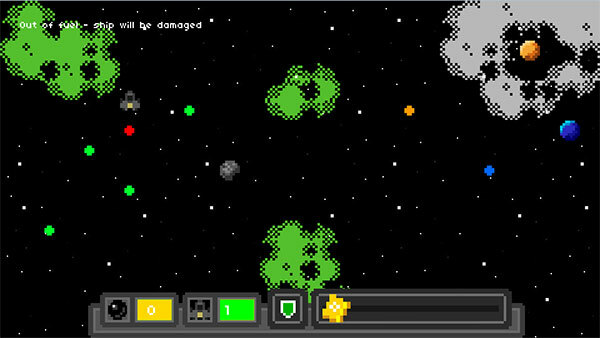 I started working on the star map simulation. The star map should feel alive and react to a certain degree on the actions of the player. There are fractions in the game as you might know. I currently have humans, aliens, ice creatures and robots. I plan to embed more. Each of these fractions will have one or more home planets as well as a value how much they don’t like you. Let’s say 0 is “neutral” and 60 would be “we hate you a lot”. The value will be decreased every time you raid a ship of one fraction depending on the difficulty of the encounter. Attack 5 ships in a row (each – 10) and you are in trouble (-50). The encounters will have more enemies the lower the value but the home planets will also start to spawn ships that will hunt you. Each fraction will have one color. Now…what do you do? Either you don’t care and kill everything insight or you lower the level again. How do you do that? Either by not attacking more (the value will go slowly down every x turn) or you attack the home planet making it difficult to send hunters towards you. Will it be fun? I am going to find out soon! Should there be interaction between the fractions? Every new game start will give you a specific goal. Find x artifacts, kill x specific persons, find x specific coordinates….the game will end once you found the final one. They will all use the same system. Some ships (treasure and reward grind) travel on routes while scripted and important encounters won’t move and will disappear once solved. A suggestion; perhaps there is a way for you to raid a ship and not take the hit to your faction score (or maybe not all of it). I can imagine that if there were some way you could keep word of you being involved from reaching the faction that would be a favored "secondary objective" by the players. 2. Prevent the enemies from triggering a distress signal when boarding. I was thinking in that direction and i am happy that you see it that way. It allows a different playstyle. What i already have: Dectection mode for enemies, triggering a local alarm and security cameras. This is a good basis. I would keep the local alarm (triggering more enemies and making levels a bit more hostile) that i have and start a counter if there is a transmitter onboard. The fraction value will be changed if this counter reaches zero. (This should be visible at the transmitter. Anyone else liking these ideas? I think it's important to show in the interface how much a fraction likes/dislikes you. GTA 2 had something similar for the gangs. Would you prefer the GTA2 style or the one with the smileys? Right now it doenst make sense to show "positive" because you cant do jobs for a fraction. I could link it though to "attack Fraction A" increases value for Fraction B. That would be very close to the Pirates from Sid Meier. I have a rough version running but need to test and debug because i have to change all "actor type" behaviours to group methods. Sounds like a good time… not! The coding that is. Your game is shaping up very nicely! For the post above I kinda like the smileys. Just a cleaner looking UI. I can only imagine! Have fun with that! Puh...got it all working. The game supports now various characters and acts accordingly. First draft of the select screen is below. This screen appears when you start a new game. New characters will be unlocked through finishing the previous one. I am working right now on the UI and the system that you get a different gameplay when choosing the same character over and over again (in case you like it). That is a good game. Would you like to join "Infinity Systems"? We are currently working on an AI behavior and a 3D system. I saw your post on "ask a question".